It’s celebration time. At least, that’s how it feels in our house. May and June are packed with weddings, our baby shower, trips and deadlines. Now that we’ve got a little thing like a due-date circling above our calendars, we’re cramming in a lot of excitement into a few short months. And what do you celebrate with? A cocktail. Or, a mocktail. However the shoe drink fits. In my non-pregnant life, I’m not really much of a mocktail person. I prefer either alcohol or water to sip on, without much in-between for beverages. Perhaps it’s because I’m not a big fan of plain juice, or that I prefer my sweet beverages to have a little kick to them. Either way, I typically go big or go home. But, obviously not this year. 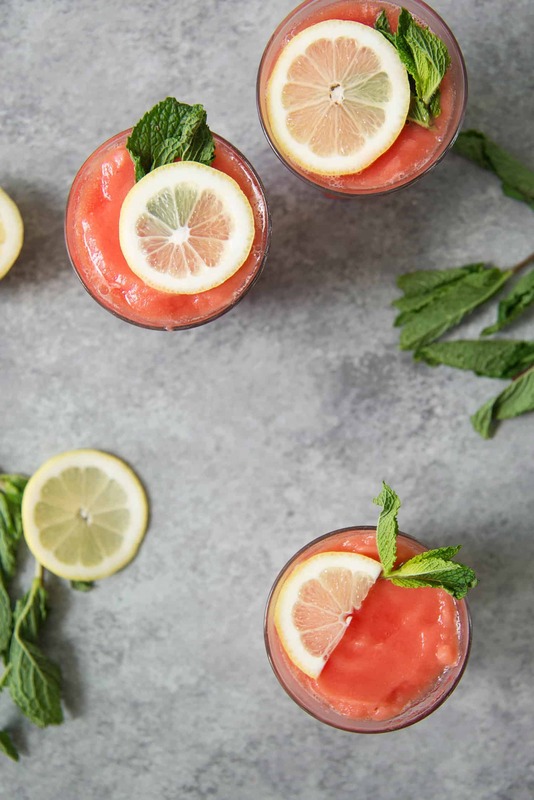 I’ve been sipping on just about everything iced: green pineapple drinks, raspberry limeades, frozen lassis and now these watermelon mint lemonades. As the temps continue to climb, I have a feeling this is only the beginning of my mocktail summer. Frozen watermelon cubes are pretty glorious. They puree up to a thick, frozen treat that reminds me a fruit-flavored frosty. If I’m feeling lazy, I’ll just throw a bunch in the blender with a splash of juice for a quick and refreshing treat. These take an extra step, combining both frozen watermelon cubes and homemade lemonade. Tart and refreshing, it’s the perfect way to celebrate whatever events you have coming your way. This month’s Recipe Redux theme is all about cocktail (and mocktails) to celebrate the summer with. Once you’re done trying this one, check below the recipe for a round-up of healthy food bloggers showcasing their colorful drink concoctions. 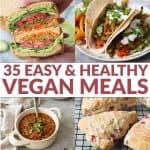 I started pairing herbs with sweet recipes a few years ago and have been hooked ever since. 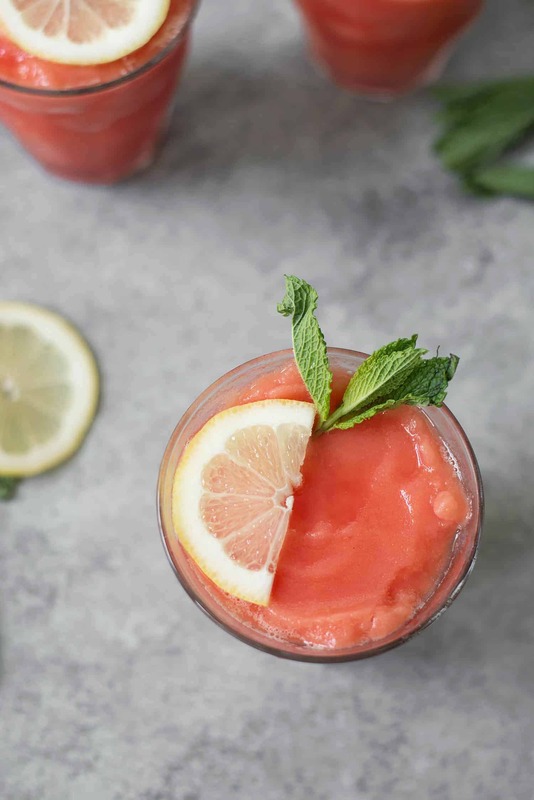 The mint is subtle in this drink, but really helps to balance the tartness of the lemon and sweetness of the watermelon and syrup. Since mint grows like wildfire this time of your, I’m hoping you’ve got some in your yard to take advantage of. If not, I’m sure your neighbors do so, um, forage away! Lastly, depending on the strength of your blender you may need to play around with the ratios of the frozen watermelon to the liquid. 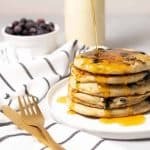 A high-powered version (like a BlendTec or VitaMix) should be able to handle the recipe as written, but if it’s too thick, add in a splash or two of lemon juice or water. I typically start without any extra liquid, then add as needed. If you’re using a regular blender, you might want to start with smaller watermelon chunks, pulsed down, then added to the rest of the liquids. Remember, you’re looking for a thick, frosty-like consistency, not a juice or a thin smoothie. And, in case it needs saying, vodka or gin would be welcomed here. Frozen Watermelon Lemonade Slushies! These refreshing beverages are perfect for hot summer days. 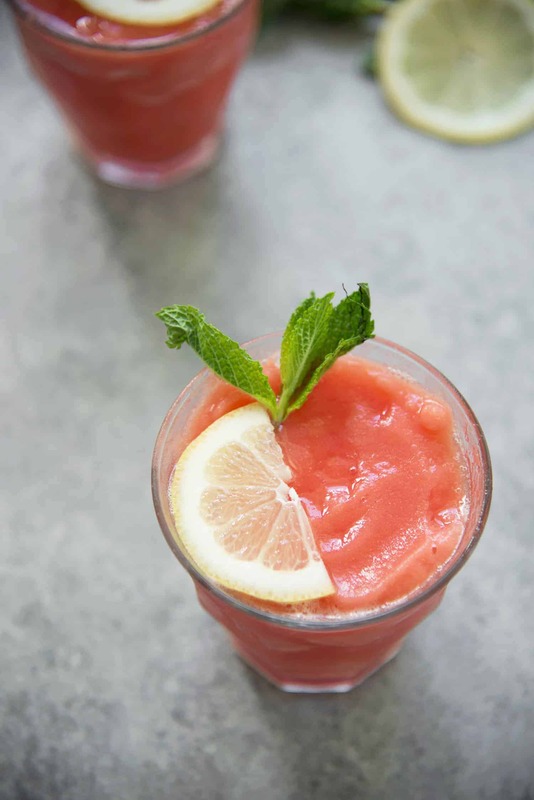 Mint, lemon and watermelon pureed together to create a thick and frosty beverage. Enjoy with or without alcohol! 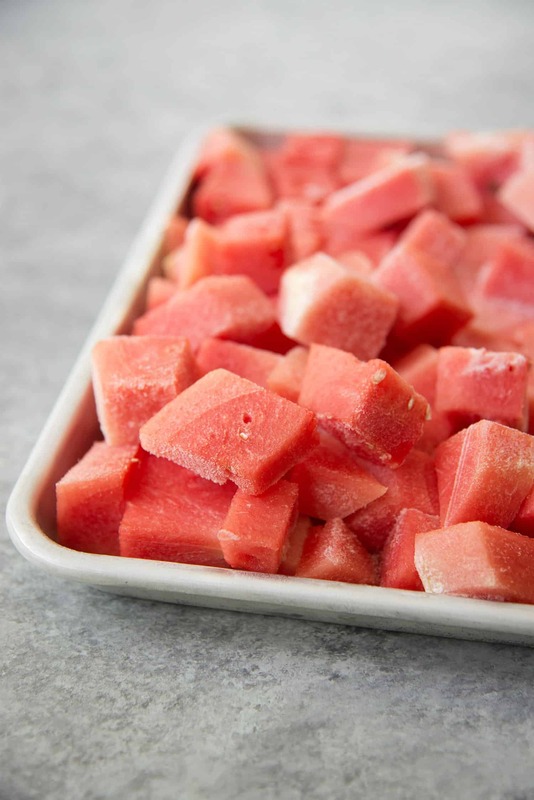 Cube the watermelon and place in a single layer on a baking sheet to freeze, at least 2 hours. Keep frozen until ready to use. 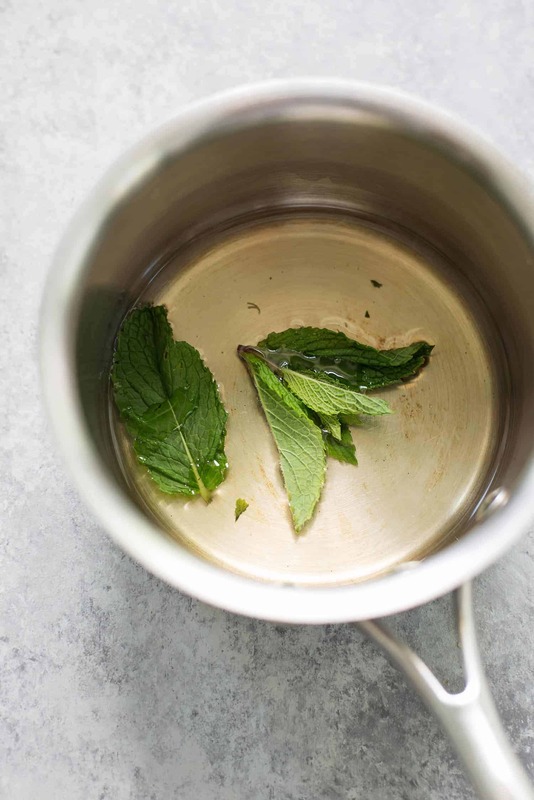 Place the sugar, water and mint in a small saucepan and bring to a boil. Reduce heat to a simmer and cook for 10 minutes, until reduced and sugar is completely absorbed. Let sit for at least 15 more minutes off heat so that mint can be infused into the syrup. Before using, remove the mint leaves. 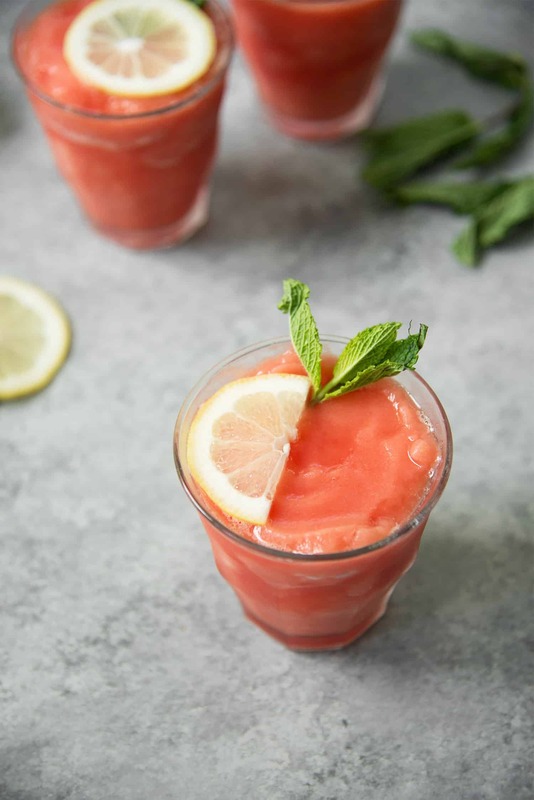 Place all of the ingredients in a high-powered blender (if you use a regular blender, you may need to add the frozen watermelon cubes in batches): frozen watermelon cubes, mint syrup (with mint leaves removed) and lemon juice. Puree until thick, then slowly add in water/alcohol until a thick and creamy texture develops. Depending on the strength of your blender, you may need less or more water. Divide into 4 glasses and serve! I didn’t test this recipe with alcohol as I’m currently pregnant, but I can’t imagine that it wouldn’t work beautifully. My blender needed 3 tablespoons of water to create a creamy slush texture, but sub it out for any alcohol of your choice (I’d prefer vodka), plus more as desired. Feel free to play around with the ratio of frozen cubes to alcohol to create the strength that you want. Enjoy the entire round-up of Recipe Redux beverages here. This sounds perfect for a really hot day. Not sure if I could freeze the watermelon before I ate it all though haha. I have a tendency of not being able to keep watermelon around for very long lol. I am totally not a watermelon girl, but these sound REALLY refreshing! Yum!! can’t wait to try this! I’m all about anything fruity and frozen lately!